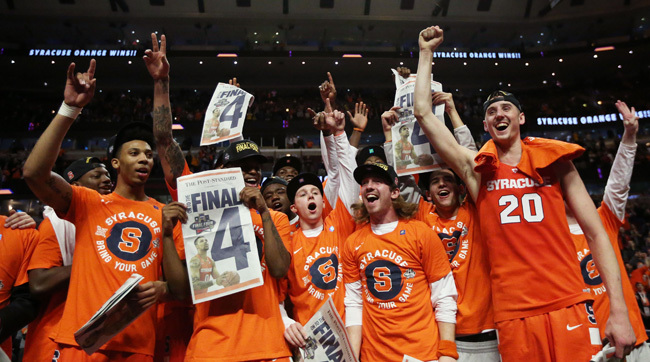 ​Heading into the Final Four this weekend, the Cinderella team is… Syracuse? One of the most successful teams in college basketball, the Orange entered March Madness as a 10 seed in the strong Midwest division. The team wasn't supposed to make any noise — in fact, most people predicted it would get bounced by the amazing Michigan State Spartans or Virginia Cavaliers. Then Syracuse (with some help from other key upsets) started busting brackets on its way to Houston. In the first round, the Orange trounced number 7 Dayton, 70-51. Next, another demolition, this time of 15-seed Middle Tennessee, 75-50. The Orange squeezed by number 11 Gonzaga, 63-60 in the Sweet Sixteen. That set up what many thought would be Syracuse's final stand: an Elite Eight date with number-1 seed Virginia. But the team shocked the basketball world again, clawing and scraping its way to a 68-62 victory. The next test: a Final Four date with the University of North Carolina — its ACC rival and the only 1 seed left in the tourney — on Saturday. 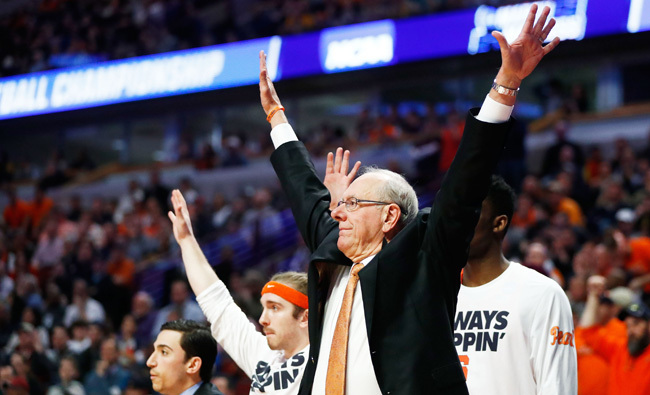 Syracuse is the first 10-seed in history to make it to the Final Four. (Three 11-seeds have made it to the semifinals.) And its ride is definitely one of the wildest in recent memories. No one expected the team to make this kind of run — because no one was sure if it would even be in the tournament at all. ​Last year, the Orange sat the tournament out. It placed a one-year postseason ban on itself due to an NCAA investigation into potential violations committed by the team a few years earlier. For the 2015-16 season, it was thought that Syracuse would need time to get its basketball program back on track. Making the tournament would be amazing — but expectations were low. The regular season seemed to confirm that it would be a tough road. The team finished 19-13, going 9-9 in the ACC and ending the year with three straight losses. That included an early exit in the ACC Tournament. So when this year's bracket was announced, more than a few people were surprised that Syracuse squeaked in — and as a 10 seed, at that. Once the tournament began, and so many top-seeded teams began to fall, it looked like the Selection Committee had made a bunch of mistakes. But one decision they got right was including Syracuse in the field. The Orange came out swinging, defeating Dayton by 19. 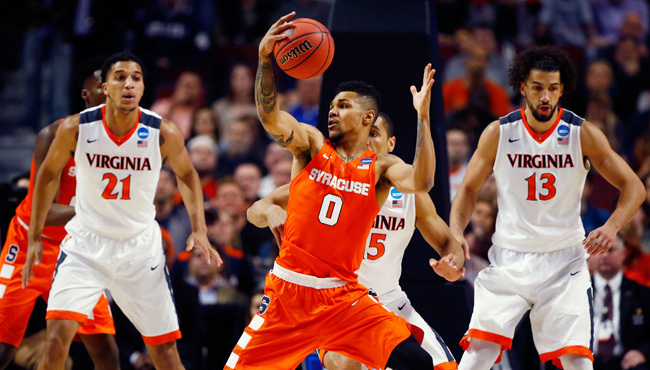 Malachi Richardson dropped 21 points, while Michael Gbinije scored 10 and had seven boards. And then SU got lucky when Michigan State were shown a first-round exit. Instead of facing a team everyone considered a favorite to become National Champions, Syracuse faced Middle Tennessee. Gbinije scored 23 points with a couple assists and steals as his team soared past the Blue Raiders. Then the team upset fresh-off-its-own-upset Gonzaga and, suddenly, Syracuse is in the Elite Eight. ​But it had a difficult game, against the Virginia Cavaliers, a 1 seed who cruised to the quarterfinals. Once the game started, it looked like Virginia would dominate — as expected. Then Syracuse scored 15 straight points and took a late lead. Virginia tried to rally, but its effort was not enough. And, suddenly, Syracuse was in the Final Four for the first time since 2013. With two number-2 seeds (Villanova and Oklahoma) and a 1 seed (UNC), Syracuse is definitely the outlier. The highest seed to win a national title is 8 seeded Villanova in 1985. So the odds are absolutely against Syracuse. Houston might be where Syracuse's Cinderella run ends. It's unlikely the Orange will upset two number 1s back to back. But this is March Madness! Upsets are the norm — especially this year, one of the maddest Marches ever.